When you're thinking about author intrusion (or any element of craft) remember that I'm not suggesting that you change the way you compose your first drafts. Each of us must allow ourselves to create in the way that’s most comfortable and natural for us at the moment. But in a career that spans a decade or two, you also want to remember that what works for you today may not work tomorrow. Your process may change as you become increasingly comfortable with certain skills, or as life impacts you along the way. If you’re aiming at having a long career, expect changes. It’s easier to adjust if you know they’re coming! 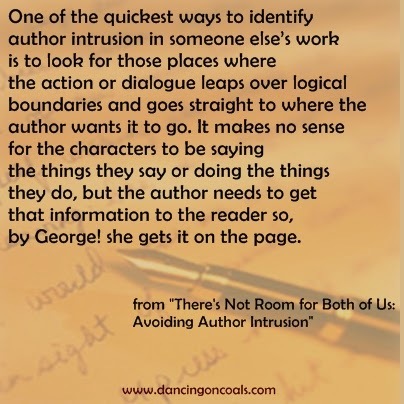 As with most areas of the writing craft, avoiding author intrusion is something you want to watch for when you’re revising your scenes, your chapters, a particular section, or the whole book after the first draft is finished. Maybe you’ll write a scene, read it, revise and polish it before you move on. Maybe you prefer to write the entire first draft and then revise. Maybe you prefer another method of revising. They’re all okay, so do what works best for you. But when I say what works best, I don’t mean what’s easiest or what comes most naturally. I mean do what consistently brings about the most positive results in your work. Do what creates the strongest scenes and makes your work the best you’re capable of writing. Also, keep in mind that you will never completely rid your work of every instance of author intrusion. The goal isn't to be perfect. We all know that's not possible, and a book that's too perfect may lose the spark that brings it to life in the first place. Bits and pieces of author intrusion will sneak into your work from time to time, or you may choose to leave something in for a particular reason. Sometimes there’s no way around it. But your book will be stronger if you strive to minimize the accidental instances of author intrusion in your work.